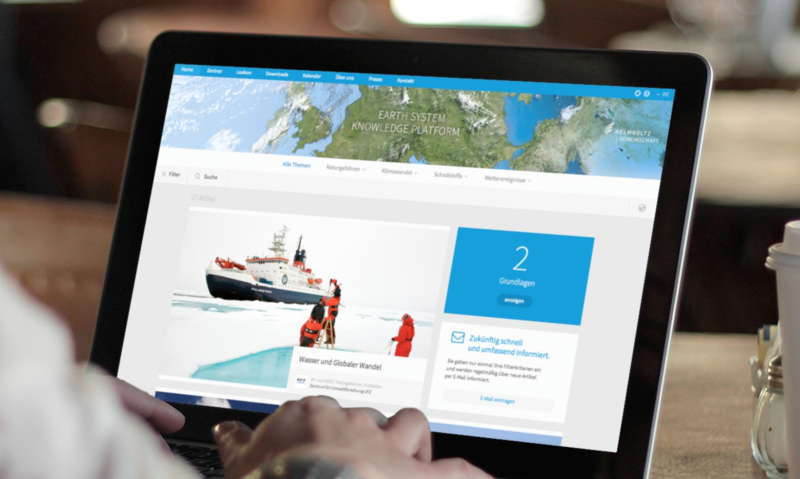 The „Earth System Knowledge Platform“ ESKP is a collaborative project (eight Helmholtz Centres, e.g. DLR, GFZ, GEOMAR, AWI, KIT). The aim of this project is to establish a web-based knowledge platform that focuses on the risks and chances that arise from the changes in our global environment. For that purpose, well-grounded knowledge on the topics of water, soil, climate- or natural-disasters will be edited in form of interactive maps, infographics, videos etc.. The platform serves as a source for society, politics and the economy and enables them to profoundly plan a better future. The portal provides a heterogenous target audience with a highly aesthetic, thoughtful, and didactic presentation of information in multimedia environments as well as with up-to-date information from experts on natural risks and disasters from around the world. The IDL is responsible for the user-centered design process, the development of a new information architecture, navigational concepts and new responsive design for the platform. The team was able to use their knowledge on science communication concepts, which has become one of our research foci over the last few years.